It’s been so long since I’ve listened to radio that most of the preset buttons on my car radio are set to rock stations that no longer exist. Lately, though, I’ve been revisiting the airwaves, listening to 94.7 FM Family Radio on the way home from my sunset runs along the Jersey shore. More often than not, the sound I hear when I tune in is that of pages being turned. The page turner is 89-year-old Harold Camping and he’s seeking out a Bible verse cited by a caller to Camping’s nightly call-in show, “Open Forum.” Each caller is allowed one question about a verse in the Bible, which Camping answers in a dry, dignified, unhurried monotone. When his answer is concluded, Camping says “Thank you for your call to Open Forum,” and another caller comes on the line. Driving in my car, I’m thinking to myself, THIS is the guy who’s predicting the end of the world is at hand in a matter of days? 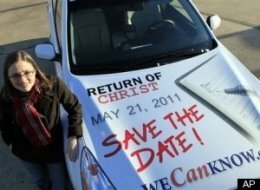 THIS is the guy who’s putting up billboards everywhere that say “Judgment Day Will Occur May 21, 2011” and “The Bible Guarantees It”? You’d think he’d be bringing a little more urgency to bear on the subject. The first night I tuned in, I was bracing myself for some hectic, over-emoting, fire-and-brimstone, Bible-thumping scourge. But Camping never raises his voice; he never changes his cadence. He addresses every caller in the same mild, scholarly tone. If a fawning fan calls to gush over Camping’s wisdom and saintliness, Camping reproves the person gently for not having a question and moves on. Outright cranks who call up to taunt Camping get the same treatment. The producers of Open Forum urge callers to stay on the line, because every call is answered, and that seems to be true. The producers don’t seem to be screening anybody out at all. Camping’s approach to the Bible is very literal and, in some cases, mathematical. He never philosophizes about events or statements in the Bible. He never makes a show of trying to draw his own conclusions. He believes it is a sin to speculate about the thoughts or intentions of God. The words, he likes to say, are right there in the Bible; extra commentary is unnecessary. The programming on Family Radio reflects this mindset. You get a lot of studious, matter-of-fact content like “Beyond Intelligent Design,” “Positive Parenting,” and Camping’s own Bible Study shows. There’s very little sermonizing or inspirational showbiz on the daily schedule. 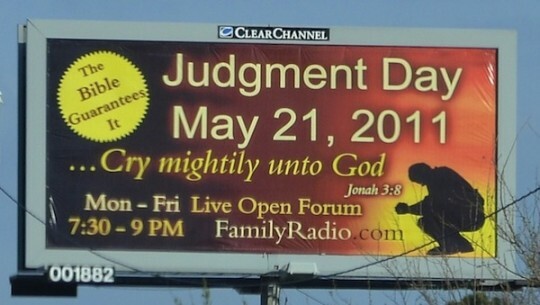 This mindset, combined with the May 21st End of Days theory (a theory which is based on Camping’s own mathematical computations as they relate to passages in Daniel, Revelation, Peter, and Ephesians) sometimes leads to unintentional comedy on the show. Camping steadfastly refuses to bring any drama to the impending End of Days, but still he finds that many aspects of his show are being rendered moot. Noting in an aside that callers are allowed to place just one call to the show per month, Camping pauses and then adds, “Since we have just three weeks of earthly existence left, you should make your next question an important one.” When a caller weighs in about her faithless husband and the bible’s injunction against divorce, Camping cites the relevant passage, but then can’t help but add, “With the End of Days just two weeks away, your husband will never have the opportunity to gain a legal decree of divorce.” Some callers check into Open Forum and try to offer Camping a way out. 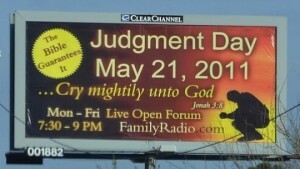 What will it mean, they ask, if the End of Days doesn’t occur on May 21st? How can we account for that? But Camping won’t take the bait. It’s a sin, he says, to even consider the question. You want more certainty and less ambiguity? Camping’s your man. This may be unsurprising, I guess, from a man whose background is in civil engineering and who made his living for decades in construction. Camping is not an ordained minister of any sort. He is “a full-time volunteer employee of Family Radio, serving as President and as General Manager.” He has stated that all organized religions are apostate and must be abandoned by those who hope to be saved. This perplexes and aggravates mainstream religious leaders, who see Camping as, at best, a nut and, at worst, a charlatan of some sort, running a scam. They may be right about the nut part, but if he is a nut, Camping is a very interesting and specific sort of nut. Organized religion is the province of careerists and showmen. Careerists focus on the science of keeping the collection plates moving. Showmen know that the key is to keep the show uplifting and vague on the specifics; keep the flock happy and expectantly hoping for some happy day just over the horizon out of sight. Camping’s approach negates this strategy utterly. Why pass a plate when the end is at hand … right … now? It also leaves no viable exit strategy. What if Camping is wrong? He’s been wrong before, in the pre-social-networked year of 1994, when you could be wrong in relative privacy. Two strikes will most likely put a damper on his syndicated empire. It’s increasingly unusual in our hyper-media-linked world to see a public figure stake such a large bet on such an unlikely—and imminent—outcome. Everyone’s out there hedging their bets, everyone’s spinning their message, managing their image. Not Camping. This is Camping’s appeal, I think, to the devout followers who call into his show and paint/decal their cars with Camping’s apocalyptic message. They tend to be working class people, people for whom there appears to be less and less future every day. People who are told that pensions, unemployment benefits, health insurance, and real wages are too expensive, too much to expect. People who are accustomed to hearing vague, open-ended promises from their politicians and ministers. Something good will happen, they’re told, but later. Not today. Be patient. In the meantime, give me your vote, your dollar. Camping’s brand of religion is one that doesn’t require an ill-defined leap of faith. His truth isn’t allegorical or symbolic. You want the truth? Look out your window. It’s all happening on Saturday! For more and more people in America, living hand-to-mouth and losing the battle, another week is about all the future they can afford. This entry was posted in Prophecies, Slanders and tagged Bible, Book of Revelation, Christianity, End of Days, Family Radio, Harold Camping, Judjment Day, May 21, Rapture by Harry Ramble. Bookmark the permalink.